1. I didn't exactly make any new year's resolutions last year: just to lose weight and get a new job. I lost weight and interviewed for a new job, so I think that's a bit of a win. 2. Finally managed a swim in Lake Tahoe, though it was extremely cold. 3. 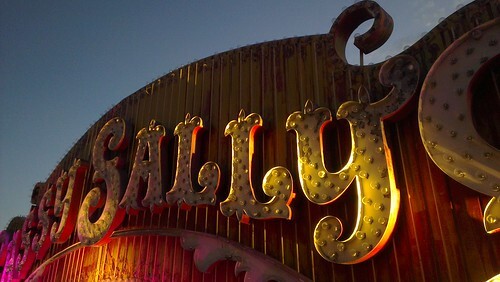 At long last, toured the neon boneyard in Vegas. I have been wanting to visit that place since about 1992, when it wasn't even open to the public. 4. Got tapped up for promotion at the exam board. It hasn't happened, but I don't think I am disappointed about that, really. It's just nice to be asked. 6. Started and finished knitting 4 garments; knit almost the whole of 3 more; finished the lace shawl kit I started in 2010 (this was defo a delinquent WIP). 7. Deadlifted 105kg. Next stop, Rio. 8. Presented to over 500 students at an exam-busting workshop, wearing a face mic a la Madonna. Made me feel a little bit like a rockstar, not gonna lie. It was also terrifying. 9. Finally bought a Kenwood for the perfect baking experience. 10. 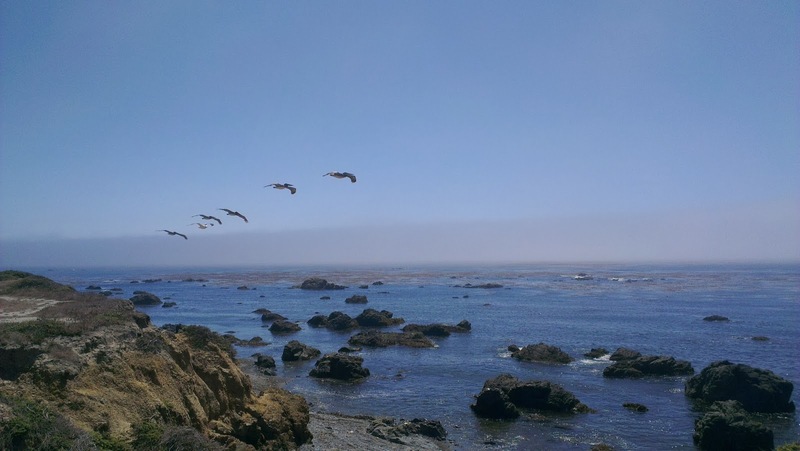 I made it 127 blog posts, by the skin of my teeth. Never thought I'd get here! It was a bit of a shock when I worked out in October I'd have to blog practically every day until the end of the year to make it....next year I fully intend to spread them out a bit more. 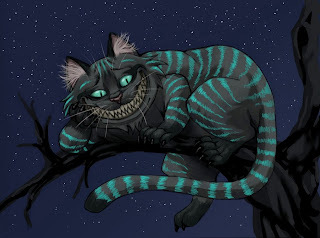 (As a reminder, this picture is not mine, and if you click on it you can see the original plus some other wonderful fan art inspired by Alice). This is what I decided I wanted to knit next when I realised that all I had on the needles was a 100% silk hat which is basically just a rectangle but which is knitting up excessively slowly, and Parpy Jo's black lace scarf which requires counting and concentration. So, I cast on a week ago and have been motoring through ever since. 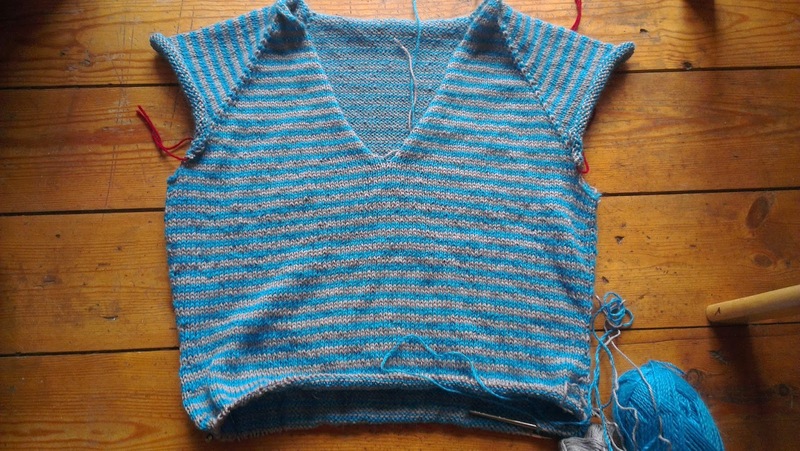 I really love top-down raglan as a method of knitting, because it gets the time-consuming, boring business of doing the yoke out of the way first, and I can try it on regularly for length. 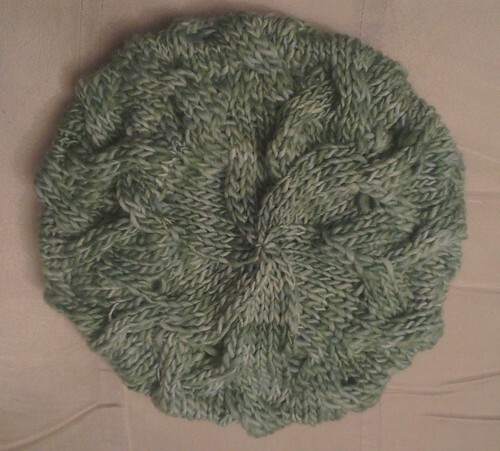 Not bad for a week's work, especially not considering it is a week that has also included the casting on and completion of Mother Hand's Christmas hat. 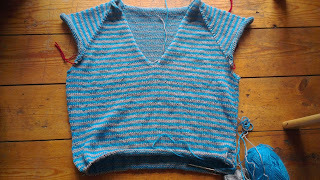 A generous estimate of 16 stripes is left before it's time to bind off the bottom. 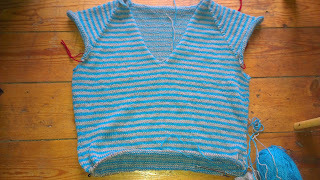 The pattern - Pink from Wendy Bernard's Custom Knits, again (very pleased to now have knitted two patterns out of this book I have owned for over a year) - calls for ribbing at the bottom, but I think I will just do an icord bind off. 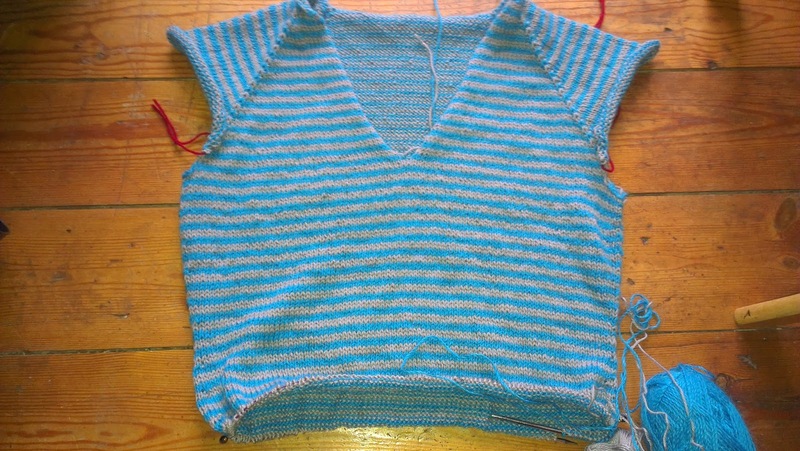 It's a bit drapy for ribbing. I had getting on for 5 50g balls of the grey yarn - Knitpicks Elegance leftover from this sparsely-worn cardigan - and 4 100g balls of the turquoise, which is Alpaca Select DK. At this point I am rapidly approaching the end of ball 3 of Elegance but have only just joined ball 2 of the DK. I have concerns. I had hoped for very long sleeves with thumb holes, having always wanted a sweater with sleeves that come over my hands, but I anticipate the yarn won't last, unless I make the bottom portion of the sleeves solid turquoise. There is some of the grey left in Ravelry destash (the yarn is discontinued now) but that hardly adheres to the rules of stashbusting, does it? Anyway, I am considering pausing at the end of the next ball of Elegance and knitting the sleeves before I finish the body, so I can make sure I have enough grey to at least get me to elbow-length. I have a ball of mint green DK, too, which might be pressed into service, somehow. As for that DK, it is an odd yarn. It sheds a lot. The label says it is a 50% blend of alpaca and acrylic but I am wondering if it might be mislabeled, since this yarn doesn't exist on Ravelry. Having had a look at the website, this seems like the most obvious match for it. It certainly doesn't seem to have any of the positive acrylic properties to it. I am concluding that alpaca is altogether a bit insipid for garments, at least the ones I am choosing. I think I will probably have enough leftover for a whole other garment of some description, though, so I had better keep looking out for drapy patterns. This is going to be the blog equivalent of a slide show. This is the hotel where we stayed - The Beautique Hotel Figueria. It was very fancy. There were buttons by the bed with which one could open the curtains, and the blinds. There was a spa, which we didn't use, but which occupied the top floor and looked very nice. There was a robe and free slippers on arrival. There was no lock on the bathroom door, there was no bedside light, and the whole room was quite dark, probably because the walls were painted dark green and all the fittings were dark wood, or black. It was very chic, in other words, but not especially practical. But the bed was super comfy and the room was surprisingly quiet, considering it looked out onto a busy square. This was much appreciated on day 1 particularly; we'd left our Heathrow hotel around 3am for the 6am flight and, after dropping off our luggage, taken an open top bus tour of the city. The four hour nap that followed when we were able to check in was most welcome. Lots of the buildings were tiled on the outside. Beautiful. Tutty did not appreciate this; "More tiles," she sighed. I think she secretly liked it. There were quite a lot of these purple-blossomed trees around. When the bus stopped at a roundabout and I took a picture of a statue, some guys smoking outside a building started yelling at me and posing, so I took their picture too. Well, why not? We got into a bit of a habit of eating cake here. It was on the next corner from our hotel. The national cake is a kind of custard tart with a really delicious, flaky pastry around it. I tried that. I tried some other things, too. They were all delicious. This beautiful creation is a water fountain in Sintra, which we visited on our day out to the coast. The road winds up a hill from the bus stop to the main part of town, past a variety of sculptures on the other side of the road (of course - more sculptures). Seeing things like this made me want to visit Grenada and the Alhambra even more. Maybe next year. Final thoughts? It was a lovely city. I think I would like to go back, though only for a few days again. It would be a nice place to hang out and do nothing - if you like the sort of holiday that involves lying on a beach with a book, but you don't like the beach, then this would work. There are so many cafes and little nooks in which to hide oneself, you could spend several days touring them. There are a few places I wish we'd visited, but we were only there for three nights and I think we managed to pack an awful lot into that time. I do wonder though (nerd alert) what would have happened if they hadn't been struck by the earthquake. Portugal was obviously extremely powerful in its day and Lisbon was the centre of that, and then all of a sudden it seemed to stop. I don't know enough about it to know why; I wonder if it is connected to loss of wealth and inability to maintain foreign colonies whilst rebuilding at home. Because of when the earthquake struck, there were candles burning in churches across the city, which caused enormous fires, and then the tsunami came in too. They considered abandoning the city and starting again from scratch, elsewhere. That must surely have had an impact, somehow. Anyway. One day I will find out. As well as the traditional tiles, with the heavy Catholic overtones mixed with Islamic influences, and lots of yellows and blues, there was a whole section of the museum which displayed more modern designs. This was my favourite bit, although I think Tutty liked it least of all. I think she might have struggled to pick her least favourite part though, truth be told; I gave her a tile coaster as a bit of a joke Christmas present and she did not seem overjoyed to be reminded of the experience. It did take a moment of looking at this one to realise it is a slightly creepy rendition of grasshoppers. I wish I'd bought a guidebook or something, or been able to read the Portuguese labels. The colour of this one reminded me of some of the stuff I made for my ceramics GCSE. This lustre glaze was very expensive and my pottery teacher would only let us use a very small amount at a time. I made sure I got a picture of myself carefully reflected in it, too. Unsurprisingly, this one was my favourite. Look at the colour! This was the display from the foyer. It was very big - probably the same height as me, or a little bigger. I really liked the colours in this, too. There was some artwork, too, styled using cloth and clay. This also reminded me a lot of my GCSE, when I made one piece out of a fabric sofa I sewed, soaked in liquid clay and then fired. I was in my element! 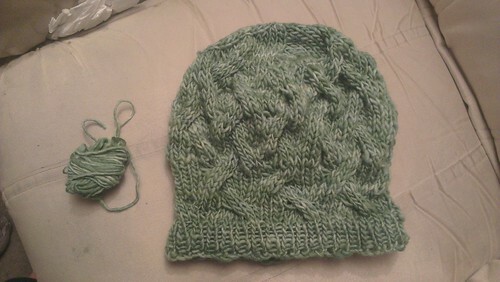 There was a satisfyingly small amount of yarn leftover at the end. I bought this yarn from my friend Emma when I went and shopped her stash in May, intending to do something with it for Mother Hand. I promptly forgot all about it and only rediscovered it when I was trying to wrestle my stash into some kind of order in the spare bedroom yesterday. Since Mother Hand is coming tomorrow and it seems to be becoming some kind of Christmas tradition that I knit her something very last minute that I wasn't planning to knit, and have to rush it. Luckily, this nifty little thing knitted up in one day. 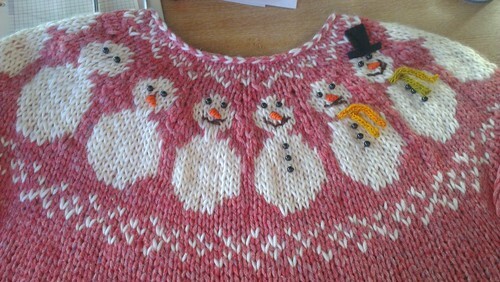 This is the second of these I have knit for Mother Hand. 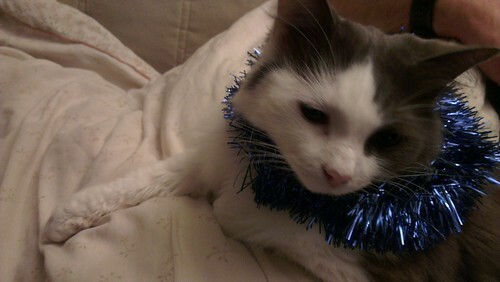 The first was for Christmas two years back, but she unfortunately lost it some time in the last month or two. I got quite an elaborate story about how she had left it on the dashboard of her car and left the car window open and that is when someone must have stolen it, although it was funny because nothing else had gone missing....it was like the time she told me she had given my ancient, cracked travel mug, which I had given her when I got a new one, to a homeless girl whilst out on Street Pastors, filled with hot tea, and the homeless girl had gone when she came back for it. I don't really understand why these events require such tales. Perhaps I am being uncharitable and both of these stories are true; but I would prefer, "Sorry, I left it on a bus" or whatever the truth of the matter is. Honestly, though, between lost hats and felted mitts, I might have to give up and declare her unknitworthy. She is just about the only person I regularly knit for, though, so I suppose I will let her off. I am quite impressed that I have made it over a month of ownership before declaring that the new Kenwood Chef is my FAVOURITE THING. I really love it. Making cakes was never an arduous or particularly time-consuming thing for me (I hate to come across all faux domestic goddess but I do generally find the whole process quite soothing) but thanks to this thing, I almost don't even have to be present. 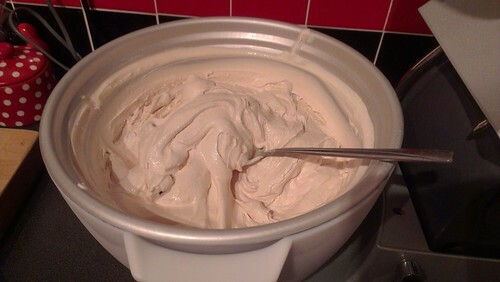 I can whip up a batch of cakes in just a few minutes; it's easy to clean and powerful and relatively quiet, and it makes really delicious ice cream. Perhaps, actually, Mr Z makes really delicious ice cream: this is cardamom ice cream with chocolate cardamom pieces and I ate so much I felt violently sick for several hours, it was so good. I love that it came with an ice cream maker attachment. 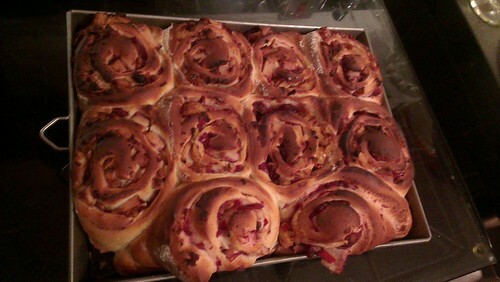 Turkey, cranberry and stuffing chelsea buns, from last year's GBBO Christmas special. I just chucked the dough ingredients in the bowl and set it going for about 7 minutes, et voila. Perfect, elastic dough. It was definitely worth the wait! My friend Ali gave me this lovely red and white spotty cake stand for Christmas a year or two ago and I have taken to incorporating it into my Christmas decorations. 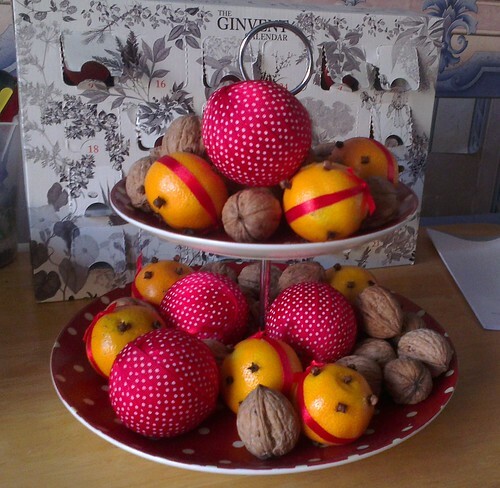 This year I decided to make my satsumas into mini Christingles by adding cloves and red ribbon. They smelled amazing when this picture was taken (in front of last year's unfinished Ginvent calendar - it might be the only advent calendar ever to last three years, I'm really not that much of a drinker). I was inspired by a line from The Woman In Black which we saw on stage in Bath at the start of the month, about the lead character coming into a house and being able to smell a clove-studded orange on the table. I made these that very weekend. Anyway. Clearly this actual Christmas decoration isn't on my wishlist because it has been adorning my house for several weeks now. The wish bit is that, I wish the satsumas would keep their amazing smell and, even more important, not go mouldy. Mouldy citrus fruit is one of my top 5 worst smells: sometimes I'll come home from work and be able to smell from the front door that there is a lemon starting to turn at the back of the fruit drawer. Sometimes I can't smell it until it has oozed through the bars onto the potatoes underneath, but that's beside the point; I would like everfresh citrus fruit for my Christingles next year, please. I suppose there's probably a scented candle I can get with this scent, though. 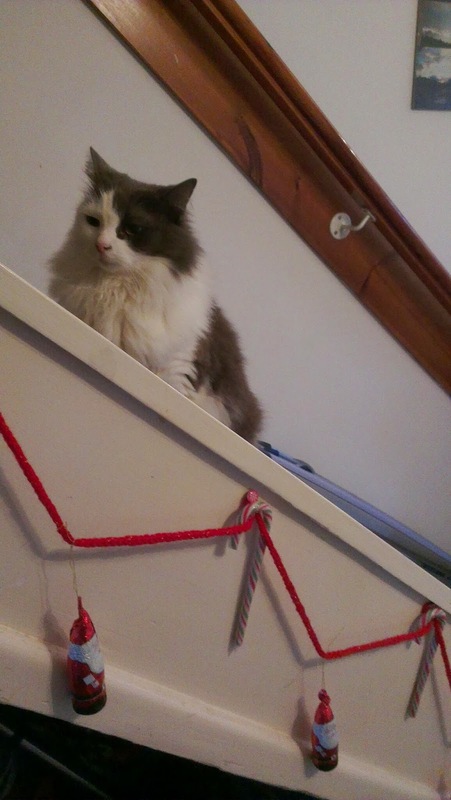 I'd been happily humbugging around all day, ignoring everything, but then HE caught me for the daily rending (which HE trivialises by calling it "brushing") and at the end of it HE left me like this. Like, the last thing I need is more fluff under my chin. Thanks a LOT. I went to a 10am Bikram yoga class today. It has been almost four years since my last Bikram Yoga class and I was interested to see if it would be easier, now that I am fitter and stronger. 1. Looking forward to this. It will sort me right out before Christmas and help dispel the last of that cold. 2. Let's have a quick look at the class timetable and the price plans. I'm sure this is going to go so well that I will want to come back all the time. I'm sure that, although I have to pay either bus fare or expensive parking, and it's in town and I don't live anywhere near town, this will become my regular thing to do. 3. Gosh, it's quite warm in here. Not as warm as last time though, I think. Clearly I am fitter and this is going to be easier. 4. Wow. I am running with sweat. My legs look like corned beef. We've only done the breathing warm up. I hope that woman behind me huffs a bit harder next time and creates a little breeze over me. 5. Wait, what? Did she just turn the heat up? Maybe I will just sit this pose out. 7. My mat smells of ammonia. Get up and leave, Sally. Only 5 more steps and there's fresh air. 8. (2 mins after) Please stop talking pretentiously about your planned new tattoo and how it has to be artistically right for you and get out of my way so I can shower before I dissolve into a salty puddle on the floor. I am NEVER doing this again. 9. (10 mins after - post-shower) Oh good grief, when am I going to STOP. SWEATING? Surely I'm going to become ill with dehydration shortly? 10. (Half an hour after that) I feel amazing. It can't have been that bad. Maybe I just need to do it regularly to get used to it. I might manage to do all the poses next time. It really was horrible. Towards the end, I fixated on reminding myself to write a blog post about how horrible it was so that I would never forget. This was what I did instead of attempting the poses, although I did try to do the first set each time, or the second set so I could see what the pose looked like first. It's not surprising that it's not my thing: I don't like yoga at the best of times, and I would always rather be too cold than too hot. But....I do feel great afterwards. I wonder if it's worth it? 90 minutes of relative hell for all this feeling of well being. Maybe. Presumably it would get easier after a few classes? I finally finished this early last week, with some brown Cascade 220 mouths, scarves made out of leftover sock yarn, and a black felt hat. I wore it to school on Thursday, hoping to place in the Christmas jumper competition, but then (possibly) made the mistake of telling off the head boy for bunking off school and talking about it on Twitter, so I didn't even get an honourable mention. I am still very proud of it, though. I will definitely be wearing it all day on Christmas day. I am filling the house full of goodies, ready for Christmas. I have tried to make a plan for what to cook and when, so we don't end up with too much, as has happened every previous year: after attempting to be 85% paleo these past four months, I worry about what the Christmas scoffage is going to do to my digestion. But, also, I don't want to miss out, of course! Instead of a fruit cake this year I have made a Tunis cake. It reminds me a lot of my Gran and although I did look in the shops, it is really just a straightforward Madeira cake so I whipped up a practice one for work last week from this recipe, and made another today from Mary Berry's recipe. Last week's sunk a bit in the middle: probably too much baking powder. Today's took a LONG time to cook and domed a bit too much in the middle. I suspect attempt number three would work the best but I doubt there will be attempt number three until next December, now. I was in two minds about topping it with ganache, too; the slightly-softened butter-spiked chocolate from the first version seemed to be the best compromise - after all, Tunis cake really should have very hard chocolate on top which is almost at odds with the soft cake underneath. In the end, though, I decided to trust in the Berry. I do love ganache. As well as that, I decided to try my hand at a pan de higo. I tried one of these last Christmas because it was available to buy by the (very expensive) slice from the New Chandos deli in town. It was very tasty and good with cheese, so I thought I'd made my own, since it cost such a lot. Toast the almonds in the oven for about 5 minutes, then chop roughly and place in a bowl. Pour the sherry, honey and salt over the top and mix. This should let the sherry soak into the almonds a bit before everything else goes in. Also, the smell of hot, toasted almonds mixed with sherry is like the smell of actual Spain. I was whisked back to a memory of my Spanish teacher at school explaining to us what turron is. Destone the dates and snip off the hard stalk bit of the figs. Place on a board and chop, and chop, and chop. Eventually the fruit will become a bit of a paste. Put this in the bowl with the nut mixture and bring together by hand to ensure it's all well incorporated. Scrape into a loaf tin lined with cling film. Put the cling film over the top and weight down with something (I used an unopened bag of flour). Leave for two days to set, then store in greaseproof paper. Obviously, since this has got to sit for two days, I won't know for a while if it works. I fear I may have been slightly too generous with the sherry but in that case, hopefully chilling it will make it firm enough to slice. Looking forward to enjoying it with some lovely cheese after Christmas day! I'm a day late with this, but I am fighting a horrible wheezy cough (thank you, endoftermitis) and was too busy yesterday trying to ward it off to feel particularly up to blogging. Today, too, truth be told - it's worse today than it was yesterday but that's not the attitude to take, really. Mr Z drove me over to the Better Food Company for some ginger tea and gave me cough mixture, so hopefully I'll be on the mend quickly. Just a quick one then. 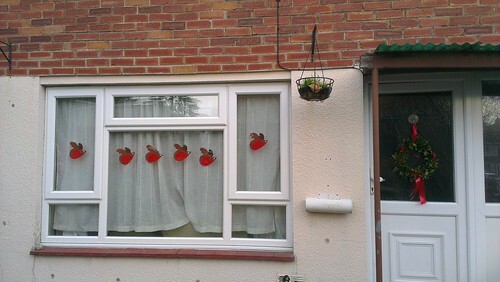 These are the robin decals I begged off a lovely high street mobile phone shop last Christmas. I think they look very striking! We weren't going to go to the tile museum. When I found it in the guide book and told Tutty about it, she seemed as excited as me until she started to enthuse with equal vigour about the electricity museum and I realised she was ribbing me. I was told, no tile museum. But then the open top bus tour stopped there and she couldn't refuse! I have a soft spot for ceramics, especially tiles, which I trace back to my GCSE ceramics course and the project I did on the tilework of a Spanish artist, Amparo, that we stayed with one summer. There was a LOT to see. Here are some of the more traditional tiles that were on display. There was a lot of repetition on the blue and white theme. I wish I knew more about it, or that the captions were more detailed: I'd love to know why and how it fits in with the other blue and white china that has been made in Europe. A hint of the Moorish influence there, maybe. Quite a lot of religious artwork here, too. I guess maybe some of it had been rescued from churches. This might have been my favourite. I appreciated the simple colours and the bird and leaf motif. This looked like the sort of patterning that might appear on the outside of some of the buildings in Lisbon. That dark pink colour was quite common, too. Next: the more modern designs. I have so many fond memories of our summer holiday this year. This picture was taken on a Pacific beach near Hearst Castle, where we spent some time wandering and watching the pelicans fly past in synchronised formations. I have this picture as my laptop background at work and today, during a particularly irritating moment, I spent some time staring at it and breathing deeply in and out. It was sunny, and beautiful, and cool enough to require a cardi. Absolute bliss! One more half day of term left. WIN. 7. 36 little hacks that will make parenting so much easier. * especially at times like this when it's 10.44pm and I still have 12 books to mark for 8.30 tomorrow. Bit of a cheat, really, as I finished these on Thursday. Of course I then intended to get natural-light pictures of them at the weekend but it hasn't exactly got light properly since I finished them and they are going to their new home tomorrow. Mods: I knitted the body of the mitt in the round. I meant to do the border knitted on but I wanted to get them finished and couldn't be doing with the faff. I don't think the colour difference shows now that the "crown" is on, though these still don't please me as much as the other pairs I've knitted did. I think perhaps the pattern really needs to sproing of wool to make it work: I knitted a pair years ago (pre-Ravelry) in pure silk and they were also a bit limp. They are gorgeously soft and I'm certain Mother Hand will love the colours, but...meh. I am a bit meh in general lately, though (I blame the end of term and also the unseasonally mild weather which is preventing me from feeling truly Christmassy), so that might be the real problem with them. I hear this Christmas thing is happening again soon. I can't really say I approve. This thing has appeared on my stairs where I like to bask and today, when I was carrying out my daily inspection of the surrounding area from the front window, this...this...THING brutally and viciously attacked me. SHE laughed and said to HE, "One of the robin decals fell on the mitten" which I feel belittled the entire horrific incident. I could easily have been mauled to death. And SHE wonders why I don't like SHE. I have heard, however, that there might be turkey associated with this Christmas business. Now, that I can get on board with. When will that arrive? I'll just bask here and wait for it.